Quick dry ink, the fast print solution? Review The main problem with shoehorning inkjet printers and all-in-ones into the office environment is the time it takes for the ink to dry. Faster drying ink means higher print speeds, so Ricoh’s Gelsprinter technology that utilises gel-based inks, is designed to offer high-speed documents, with the benefits of the large colour gamut of liquid ink. 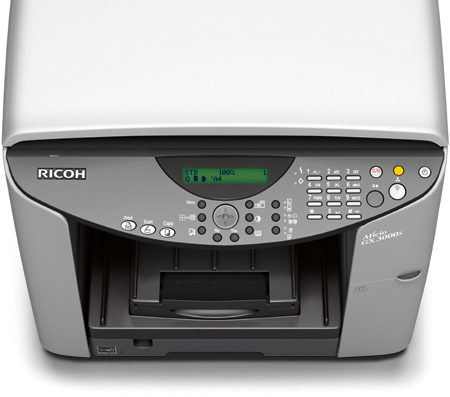 Ricoh’s Gelsprinters made a rather stuttering launch onto the inkjet printer scene, as they required a firmware update soon after launch, which held back the first production samples. 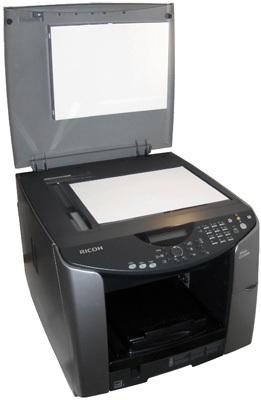 Now more established, Ricoh is still not the first company you think of when considering an inkjet all-in-one. The Aficio GX 3000S is a full multi-function printer, offering scanning and copying, as well as print, but without fax or photo print functions. You could be forgiven for thinking this is a laser-based machine, since it has a large footprint and is much higher off the desk than even other office-oriented inkjets. Although it has with a substantial inkjet printhead to move across the platen, it still seems unnecessarily tall. The simple, A4 flatbed scanner has a colour resolution of just 300dpi, or 600dpi when scanning monochrome. There’s no Automatic Document Feeder (ADF), which is a shame, given the machine is aimed at office use, but this feature does appear on the GX 3000SF and the GX 3050SFN. More of a shame is the fact that there’s no fax, even though the control panel includes a number pad for dialling. However, if the on-line PDF brochure, rather than the UK website is to be believed, the GX 3000SF and the GX 3050SFN are equipped with fax functions. The pad does enable you to e-mail scanned images across a network to any of 120 different stored addresses, but only if you add the optional Ethernet adapter. The Aficio GX 3000S comes as standard with just USB.